A U.S.-backed Syrian Democratic Forces (SDF) fighter stands on a rooftop overlooking Baghouz, Syria, after the SDF declared the area free of Islamic State militants after months of fighting on Saturday, March 23, 2019. 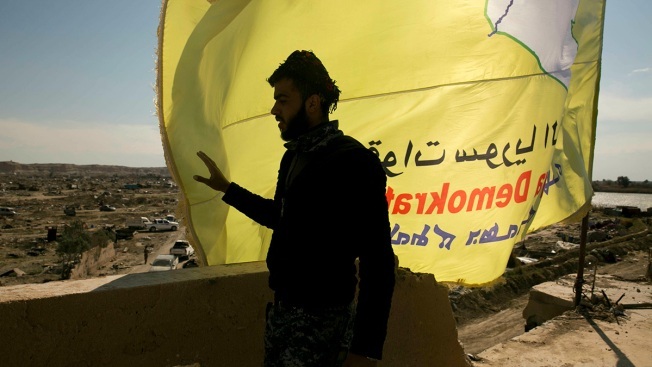 The elimination of the last Islamic State stronghold in Baghouz brings to a close a grueling final battle that stretched across several weeks and saw thousands of people flee the territory and surrender in desperation, and hundreds killed. Asked about the tribunal proposal in Washington, U.S. special envoy for Syria and the anti-IS coalition, Jim Jeffrey, said: "We're not looking at that right now." Jeffrey said the priority is to deal with the Iraqi and Syrian prisoners, which he estimated at 7,000 held in eastern Syria and representing the vast majority of those in detention. The second priority, Jeffrey said, is convincing the home countries of the foreign fighters to take them back. Germany has said bringing detained German militants home would be "extraordinarily difficult," in response to a U.S. call for European nations to repatriate their nationals. The SDF has been fighting IS since 2014 and has retaken large areas in northern and eastern Syria. Its administration is not recognized internationally or by the Syrian government, which has vowed to bring all the country's territory back under its control. Nadim Houry, the director of the counterterrorism program at Human Rights Watch, said "it is hard to imagine" setting up an international tribunal on sovereign territory without that country's approval. Previous efforts to get Security Council backing for international tribunals for crimes committed in Syria have failed, mostly because of vetoes by Russia, a main ally of Damascus. Houry said a major legal concern would be trying people for the same crimes in different courts depending on their nationality. "There is no real precedent for creating an international tribunal for some nationals and not the others," Houry said. "It is an option that raises as many questions as it provides answers." He said that while the U.S.-led coalition has provided military aid to the SDF, it has done nothing to help develop the local judiciary. "It is a fair call on the (SDF)'s part to say this should be an international responsibility, but so far the path to such help is unclear." Associated Press writers Frank Jordans and Matthew Lee contributed.